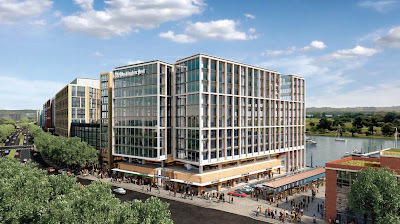 It was reported in Capital Business that Hoffman Madison Waterfront was one of several developers to respond to a request for proposals for The Washington Post Co., which is looking for a site for a new headquarters building for the paper (the new ownership group of The Washington Post will still need a new headquarters building). According to Matt Steenhoek at PN Hoffman, "we think it is a tremendous location for the Post that offers unparalleled visibility, access, amenities, views, and surroundings." 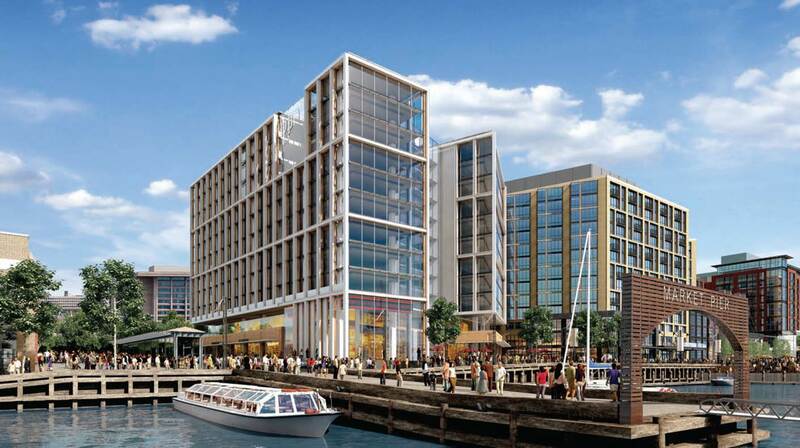 The site proposed by Hoffman Madison Waterfront is parcel 1 at The Wharf, which is currently designated as an office building. 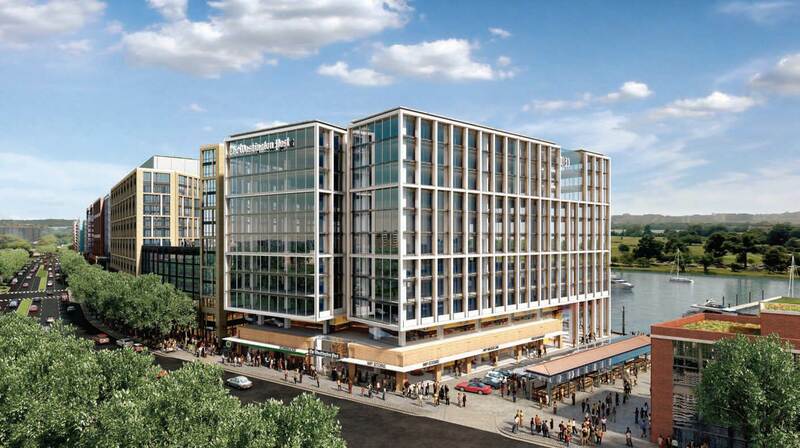 Parcel 1 is located to the west of Parcel 2 (Wharf Center and 2 apartment buildings), adjacent to Market Pier and would be near the rejuvenated Maine Avenue Fish Market. View of Parcel 1 office building from the Washington Channel. The proposed office building has been designed by KPF. 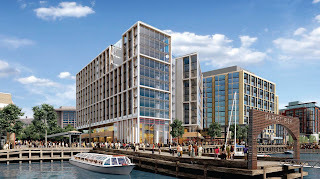 Even though Parcel 1 is planned for the second phase of development, if the Post chooses the Wharf for their new home, the developers would work quickly to get Stage 2 PUD approval and start construction on the building so it could be completed around the same time that the other phase one buildings would be completed in 2016-17. 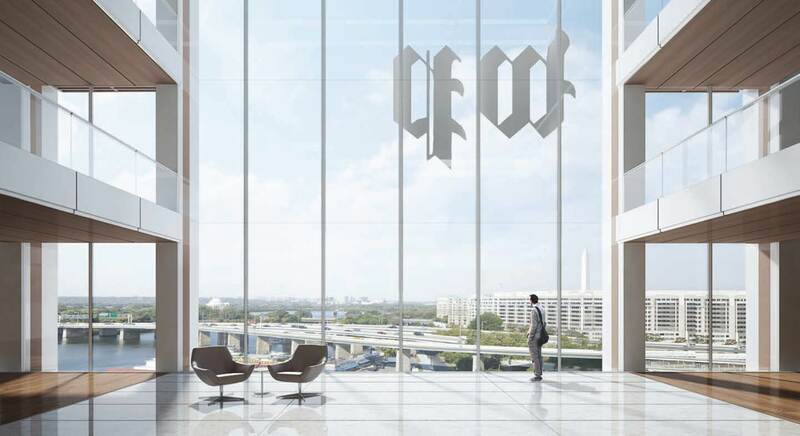 View from the inside of the proposed WaPo HQ towards the Washington Monument and Jefferson Memorial.